Contemporary British artist, Mark Cazalet, will give the Edmund Lecture at St Edmundsbury Cathedral, Bury St Edmunds at 7 pm on Saturday 14 November. The Edmund Lecture was inaugurated last year at the Cathedral as an opportunity to be challenged by a current modern thinker in the world of the arts and theology. This year’s lecture is entitled: Imagination: the great sacramental gift. Mark will use a range of images to explore this theme. He will examine a particularly British strain of reflective imagination, and conclude with the presentation of his proposal to be Artist In Residence in the Cathedral during 2016, with a project entitled A Great Cloud of Witnesses. The lecture is preceded by a creative workshop from 2 – 4 pm in the Cathedral Lecture Room. 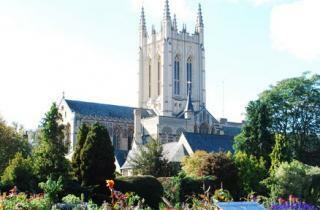 The evening lecture will be held in St Edmundsbury Cathedral at 7 pm followed by refreshments. Cost £10 (students £5.00). For further details and to book please email jaynewhiteman@stedscathedral.org or telephone 01284 748720.